Our Phase One Prototype is well on its way towards completion in late February, to be followed by a Product Launch in March. 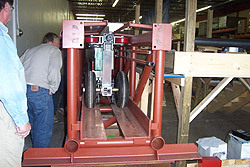 The guideway was delivered to Bell Fabrication Corp. in Blaine, Minnesota, in early January where brackets to hold the covers and power rails were installed, after which the guideway was trucked to our facility in Fridley, MN on January 22nd. 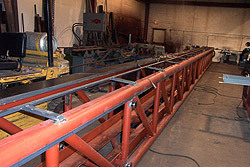 Subsequently the covers were delivered from Innovated Fabrication in Roseville, MN, and will be mounted on the guideway exterior in the showroom in our facility. The wiring in the cabin (not pictured) has been installed and the finishing work, including interior and exterior surfaces, seating and other interior features, is well underway at Excell Models + Prototyping, Inc. in downtown Minneapolis. 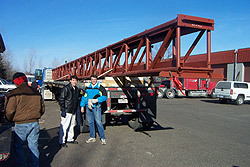 The cabin is expected to be delivered by February 21st. 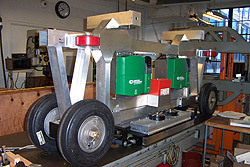 At the University of Minnesota Mechanical Engineering Research Shop the Linear Induction Motors (LIMs) and Variable Frequency Drives (VFDs) were mounted on the chassis, along with the digital encoders for speed and position measurement, shock-absorbing bumpers, and the parking brake. 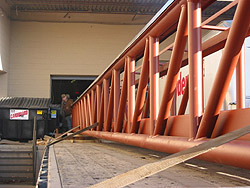 Delivery of the chassis was made on January 30th. Currently the chassis wiring is being completed for control testing. 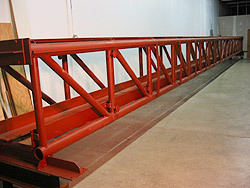 With delivery and installation of the guideway and chassis in our showroom, integration of these subsytems and testing of the control system will begin. 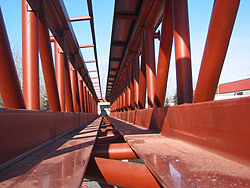 Integration of the cabin and further testing will proceed once the cabin is delivered. Carpenters, with thanks to Knutson Construction Company of Minneapolis, have begun work on the prototype station platforms. The product launch team is preparing the showroom, including painting and decorating the area. We are reviewing a proposal by an interiors professional who will advise on carpets, color schemes, lights, decorations, etc. The team is also preparing a video, a CD, invitations, press releases, and a new look to our web site. The product launch is expected to take place in March. One of the principal purposes of building and displaying our single vehicle prototype is to attract investment capitol for the next much larger phase of our technology and business develtopment program through both public and private sources. For more information of our two-phase technology development program, see the Prototype Program page. The support, encouragement, and interest we receive from a wide variety of sources keeps us going. Our Section 504 private placement stock offering to fund the Phase One Prototype program came to an end on January 31st, having raised over $600,000. All 35 slots available to non-accredited investors were filled. A new offering to fund the larger more involved Phase Two Prototype program will be announced soon, although by Minnesota law this must be limited to accredited investors. To stay on top of the latest developments of our technology and business you may sign up to receive our Email Newsletter. Open this page in separate browser window. Return to Home Page with navigation frame.